It all started out quietly enough... Last summer I was crusing eBay looking for items of interest, and nearly simultaniously two 73663's up for auction at the same time. The first one, which ended first was located in the US but had an Omega Crown, the second one was located in New Zealand, but looked correct. So I waited and watched the first Autavia go for well over $800 and gridded my self for the bidding frenzy I was sure to occur for the Kiwi example. I was pleasantly surprised when the auction ended and I was high bidder and my cost before sending payment and shipping was $560. So I sent off the funds and waited for delivery. Well the watch arrived, with a strap that was too small to fit my little sister! I mean, this watch has 20mm lugs and it had a SHORT 18mm wide strap with the hole nearly worn out two holes from the tightest position. 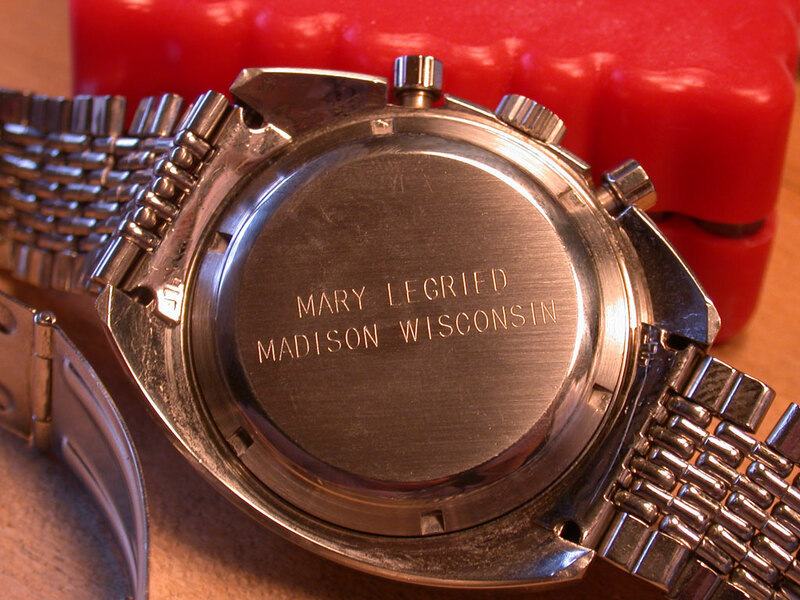 In addition, the watch had an inscription on it as shown above. In addition the pushers on this watch were corroded to the point where the understide of the pusher stems were about the same color of the Statue of Liberty before it's 1985 restoration! While the watch could be set, and ran good, and kept great time, the pushers were not operational. So it would seem to me that a lady purchased this watch too wear while exercising, and possibly swimming. The watch was in pretty good condition except for the bezel and the pushers. So I sent off the watch for service to Pro-Time. 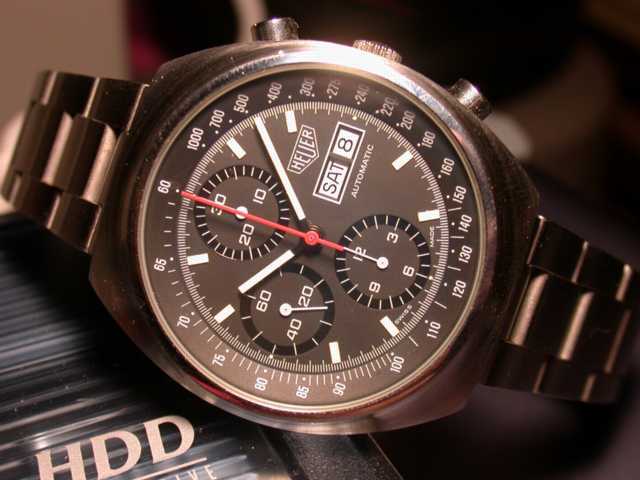 I don't know for sure, but I suspect this watch was likely sent up for Hans' gentle ministrations, and came back to me in fine form. 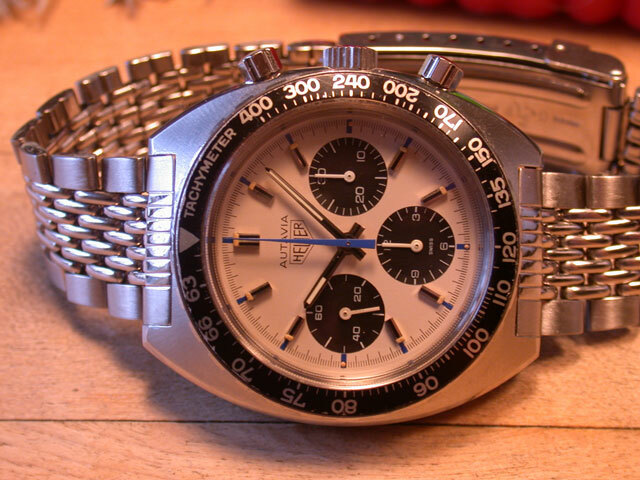 In the meantime, I purchased a proper period bracelet for this watch from Jeff Meyer via another eBay auction. At this point the watch is better travelled than I have been the last five years with trips From New Zealand to Chicago to New Jersey to Han's and back again... By the time I got the watch up to snuff I had more in repairs and the bracelet than I did the watch did originally, but it keeps good time and is a flavor I like: White dial with three black sub-dials. 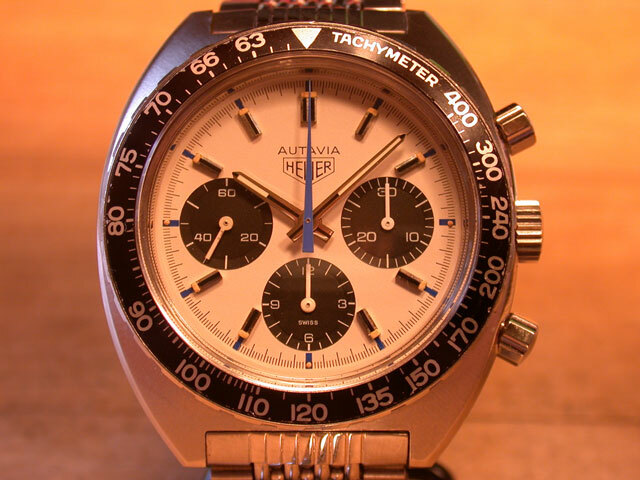 I hope you all enjoyed this watch's story, so far. Who knows where or when it will end?